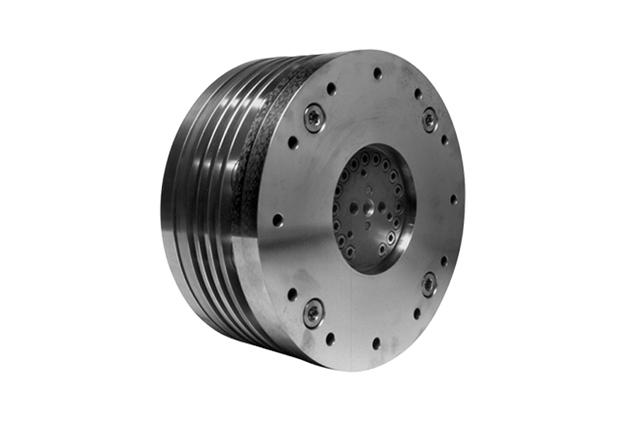 The FMD series from PT Tech is a multiple disc torque limiter that is friction-type that allows high energy, high horsepower and/or limited space applications. There are four sizes available in the FMD series which are designed to allow them to operate the drive system on the high speed side. Refer to the brochure or the chart below for the dimensional data. This FMD series of torque limiters can be produced to work with the Renold Hi-Tec PM Series Elastomeric Couplings or the American Vulkan Flexomax-GS Series Couplings. This all in one package allows the capabilities of misalignment and vibration damping capability in torque limiting. The quantity and strength of the spring-cups controls the torque setting of an FMD torque limiter. The characteristics of the operations are outlined in the Performance Data chart listed below. By adjusting the quantity and color of spring-cup assemblies, it allows the operator to verify the torque setting for any of the FMD torque limiters. Applications requiring special consideration is PT Tech's business. For assistance, call our Engineering Department. All dimensions are subject to change without notice. Selection Procedure is STRICTLY intended as a general guideline. Consult us to finalize selection and for Reversing applications.